Plants eaten from the ground to about knee high so only a leafless stalk remains? Bunnies may be at work! Join Robin to learn and start growing your own hummingbird garden! Learn how to build a hummingbird garden & see momma build a home & raise her brood with Robin! Cost: The Skyline Garden Club invites everyone to join us with a $5 donation to the club by non-members. What you’ll learn: Robin will be sharing her best tips for developing and maintaining a year-round gorgeous, fragrant, blooming garden that hummingbirds will adore. She’ll introduce you to our resident hummingbirds & migrants in the Pacific Northwest. Plus, she’ll teach how easy it is to offer fresh, homegrown food and habitat for these wonderful sprite-like creatures rather than a high-maintenance sugar-water feeder. 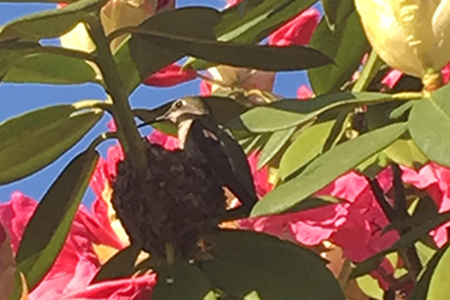 And, you won’t want to miss all the photos of nests and baby birds growing up. Wonderful presentation, Robin. I especially enjoyed your plant and tree suggestions for encouraging hummingbirds. Beautiful slides! Sorry I had to dash. I hope to see you in February 21st for my dearest friend Karen Chapman’s presentation. We can visit, then! Thanks for your kind words Alyson. I’m definitely going to try to make it to Karen’s presentation next year. Cheers!